Office 365 is just one part of the Microsoft Online Services and you can use the Microsoft Online Portal to manage your Office 365 environment as you’ve seen in my previous blog posts. 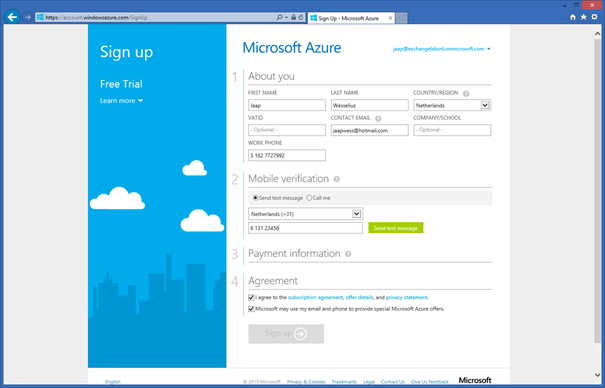 Microsoft Azure is another part of the Microsoft Online Services. 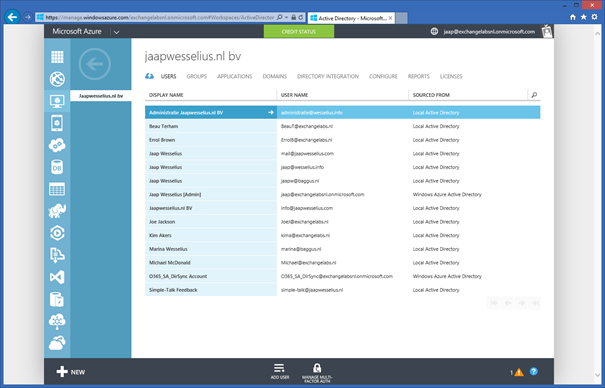 In Microsoft Azure you can use all kinds of services, servers, virtual machines and… Azure Active Directory. The portal for Windows Azure can be found on http://manage.windowsazure.com, but when you try to logon using your tenant admin account (the one you’re using for Office 365 as well) you’ll get a warning that no subscriptions are found. This makes sense because there’s only an Office 365 subscription to this account. 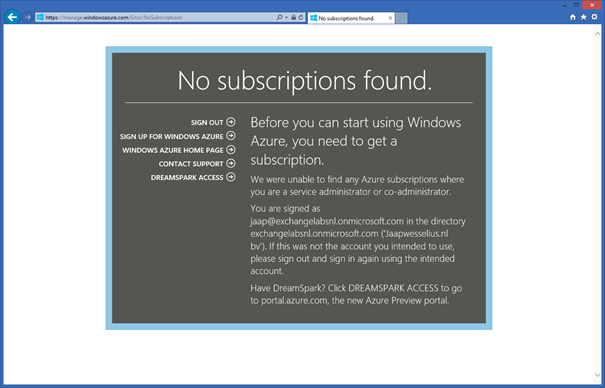 To create an Azure subscription select Sign up for Windows Azure and follow the wizard. Enter your personal data and enter a mobile phone number for verification purposes. Click the Send Test Message to receive a verification code you have to enter. This way Microsoft can make sure it’s really you and not a fake subscription. In the Payment Information section enter your credit card details and when finished click the Sign Up button (not visible in the screenshot). 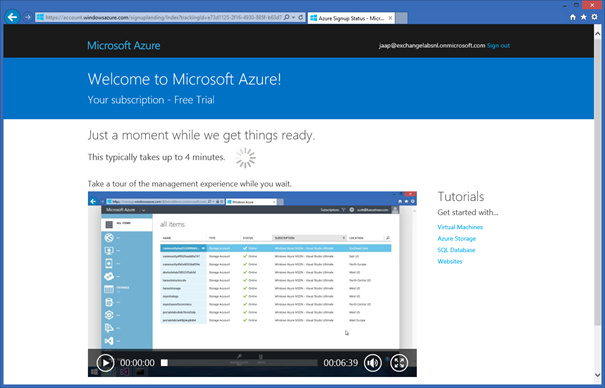 The Azure subscription is now being created, but it will take a couple of minutes to complete. When the subscription creation is finished you can click the Start managing my service button. 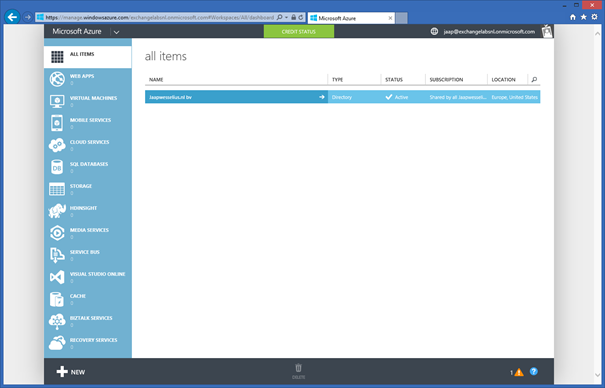 There’s the option to follow a small tour in Microsoft Azure that will explain some options in Azure, but you can skip this if you want. When the tour is finished you are in the main menu and the default directory is shown. This is the Azure Active Directory that’s used in Office 365. If you open the default directory (and skip the quick start menu) you’ll see the user accounts that were created earlier (sourced from ‘Windows Azure Active Directory’), or synchronized from your local Active Directory (Source from ‘local Active Directory’). Note. Almost all management options that are available with the Azure Active Directory PowerShell snap-in are available in this portal as well.